A walker was airlifted from Wales’s highest mountain after injuring his knee when he slipped. Llanberis Mountain Rescue Team was called out this afternoon and requested help from the neighbouring Aberglaslyn team shortly before 4pm. 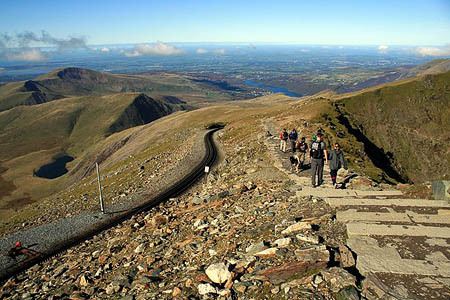 The 40-year-old man was coming down Snowdon after summiting the 1,085m (ft) mountain when he slipped and injured himself, and was unable to continue walking. Three Aberglaslyn team members joined colleagues from the Llanberis team in the rescue, while additional members were put on standby at the former team’s base in Porthmadog. A Sea King search and rescue helicopter from RAF Valley on Anglesey also flew to the scene but was prevented from reaching the accident site because of low cloud and poor weather conditions. The walker was stretchered from the site at Bwlch Glas down the Llanberis Path by Llanberis team members as far as Clogwyn Station where a break in the cloud allowed the helicopter to land. The injured man was then flown for further treatment at Ysbyty Gwynedd, Bangor. The rescue ended at 6.10pm.